It was second against third for the remaining place in the Grand Final as the Wigan Warriors took on the Castleford Tigers In Shaun Wane’s farewell game at the DW Stadium. Next Saturday night, and a Old Trafford date with the Warrington Wolves awaited and while the home side were slight favourites, few were confident about whether this would be Castleford second year in the showpiece final or Wigan’s tenth return. Castleford needed to overcome the disappointment of last weeks nilling at St Helens to overcome a confident and well drilled Wigan. The Warriors had their big guns back in the side including Sam Tomkins and skipper O’Loughlin. Castleford were missing a few first choice picks but still put out a strong looking side. It was a scrappy opening with some clumsy challenges. Joe Greenwood was held up over the line on seven and three minutes later Thomas Leuluai pushed his way through three Tigers tacklers and lunged for the line for the opening try. Sam Tomkins added the conversion for a 6-0 lead, Wigan off to a great start. The Tigers pushed and prodded a resolute Wigan defence but couldn’t break through and trouble the scoreboard despite some accurate Luke Gale kicks in general play. It had been a close first half but one in which Castleford got increasingly frustrated at their inability to cross the try line. Tempers frayed on occasions and referee Thaler was struggling to keep a lid on proceedings. 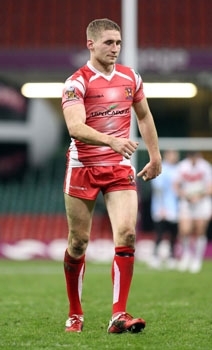 On thirty minutes Tomkins failed to convert a penalty goal from forty metres, but thirty seconds from the interval he slotted over a drop goal for a 7-0 lead. The Tigers came out all guns blazing but again it was the Wigan defence that frustrated as they kept their line intact. After a Sene-Lefao penalty for a high tackle the Warriors patiently built up the pressure with Tomkins stepping out of two attempted tackles to slide over in the corner. He was unable to add the extra two from the sideline, the Warriors 11-0 ahead. On sixty-one a fantastic game tackle prevented Greg Eden from crossing in the left corner, it would be the Tigers best chance of the night. Interference at the play the ball by Adam Milner on sixty-four gave Tomkins his second two pointer of the night to stretch the lead to 13-0. Game over for Castleford. As the clock wound down to the final hooter Tomkins slotted over another drop goal for a final score of 14-0 to see the Wigan Warriors into the Grand Final and the Tigers season fizzle out with a second consecutive nilling. It was blood and thunder game befitting of a play-off semi-final. The difference was Wigan taking their chances while putting up a resolute defence against an ultimately impotent Tigers attack. Daryl Powell will be embarrassed at the way his sides season finished, but Shaun Wane coaches on for another week and will look to deliver one more trophy to his paymasters before he moves on to pastures new. Warriors: Tomkins (T, 2G, 2DG), Davies, Sarginson, Gildart, Manfredi, Williams, Leuluai (T), Navarrete, Powell, Flower, Bateman, Greenwood, O’Loughlin. Subs: Clubb, Farrell, Sutton, Escare. Tigers: Mata’utia, Clare, Wardle, Shenton, Eden, Roberts, Gale, Watts, McShane, Millington, Holmes, McMeeken, Massey. Subs: Webster, Milner, Sene-Lefao, Clark.